CoilyQueens™ : Help I want to dye my natural hair! Your hair color can be gorgeous like hers, but you must color responsibly. 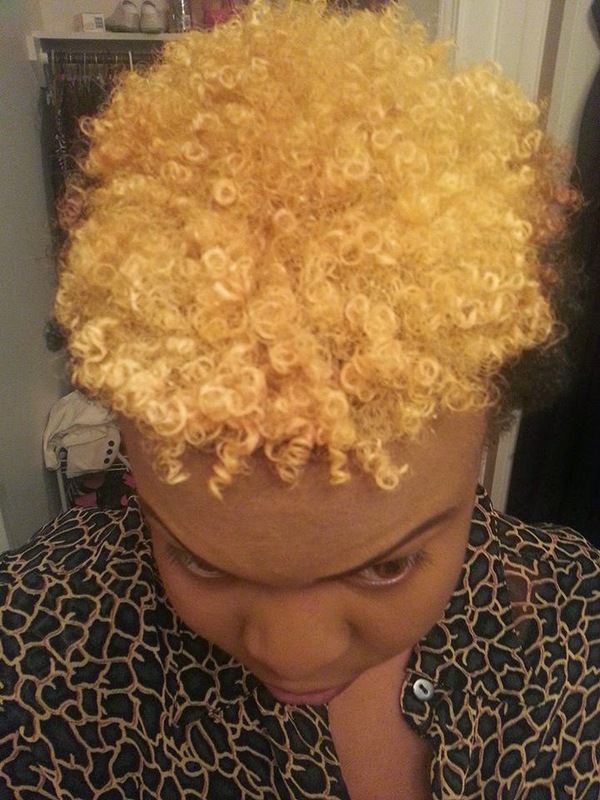 See how her curls pop, she takes care of her color treated hair. From passionate purple to bold blond, hair color remains very popular amongst women of all ethnic groups. The right color for your skin tone can take you from average to awesome! Hair color can be beautiful, but it also requires extra work on your part Adding any type of color to your hair whether it is natural henna or permanent color automatically puts your hair in a state of chronic dryness. Dry hair, which remains dry on a consistent basis will surely lead to broken damaged hair. AMONGST NATURALS COLOR IS ONE OF THE TOP REASONS FOR A SECOND BIG CHOP! There are a wide range of chemicals on the market which will add color to your hair. Whether you choose henna, temporary color or permanent color, all of these processes leaves deposits on the hair. When deposits are left on the hair, it makes the hair harder to receive and retain moisture. Henna uses crushed plants to color the hair shaft other natural colors may use black walnut or other naturally grown plants. Just because it is natural does not mean it is less harmful. Natural products contain pigments which coat the hair, this requires you to work harder to retain moisture. Most natural colorants do not destroy the hair shaft or penetrate to the cortex. However most permanent hair colors do destroy some of the hair shaft, by following a two step process. This consist of a bleaching agent which destroys part of your hair strands to remove your natural color, then it deposits your desire color into your hair strands. While most semi-permanent colors and temporary colors only coat the hair cuticle, the permanent color penetrates to the cortex. The bleach or ammonia lifts the hair cuticle to allow the color to penetrate deep. Once the process is over this leaves your hair very vulnerable and weak. Even if your hair looks great do not take that for granted, it can start to break at anytime. Once you add color you now need to treat your hair as damaged hair. Because this is exactly what it is, damaged. COLOR IS SO PRETTY WHAT IS A GIRL TO DO?? Understand that color treated hair is vulnerable hair and should be treated more delicately than your natural, non chemically treated hair. Understand that your color treated hair now requires more work than your natural hair. Understand you are no longer natural, you have changed the game by adding color. Do not spend time arguing as to whether you are still natural or not, use that time to take extra care of your hair. How you care for your hair is more important than a title. Step two: QUALIFY. Are you a good candidate for hair color? Are you a lazy natural? Are you slack with your hair care regimen? Do you only like to wash your hair once every two weeks? Do you suffer from dry hair issues on a consistent basis? Are you trying to grow your hair to waist length and beyond? IF YOU ANSWERED YES TO JUST ONE OF THE ABOVE QUESTIONS THEN YOU SHOULD NOT GET COLOR BEYOND A TEMPORARY SHAMPOO OUT COLOR. NOT EVEN HENNA. IF YOU ANSWERED NO TO ALL OF THE ABOVE QUESTIONS THEN PROCEED TO A PROFESSIONAL FOR PERMANENT COLOR. ASK FOR A CONSULTATION FIRST SO THE STYLIST CAN EVALUATE YOUR HAIR. HENNA AND TEMPORARY COLOR CAN BE DONE SAFELY AT HOME. READ THE INSTRUCTIONS ON YOUR CHOICE OF PRODUCT AT LEAST 3 TIMES BEFORE YOU START YOUR COLOR PROCESS. TAKE YOUR TIME AND HAVE ALL YOUR SUPPLIES HANDY. NOW THAT I HAVE COLOR TREATED HAIR HOW DO I KEEP IT MOISTURIZED AND RETAINING LENGTH??? Find your color treated hair care guide, here. wow..this article didn't pull any punches. Not only did it put the myth or agreement when they say color or dye hair you are NO LONGER A NATURAL! Wow, now I know. I don't want WL but I do want BSL, so I guess I can still dye my hair. Missive, Isn't your hair dyed? I hate that "if you color your are no longer natural" what! Then what am I? What should I call myself then?? chemical hair?